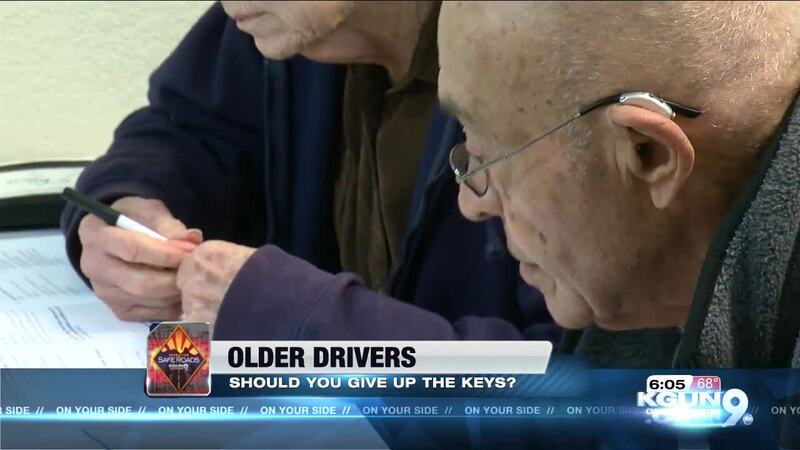 Older drivers: When do you hang up the keys? TUCSON, Ariz. - You probably remember when you were a teenager and the first time you drove on your own. There was a real freedom behind the wheel but now after a lifetime of driving you, or your parents may wonder how much longer you can drive safely. In an special Operation Safe Roads, KGUN9 On Your Side is looking at how seniors can drive safely longer, and how to recognize that moment when it's time to give up the keys. You have to be sharp to stay safe on the road. So many drivers are reckless, distracted, angry or just plain crazy you have to be ready for anything. Older drivers may not have eyesight as sharp or reflexes as quick they had when they first got behind the wheel. Susan Welch is an experienced driver who says, “My hearing is fine. I do wear hearing aids. Friends that have had problems and it makes me a little more scared." We met drivers taking a course from AARP to help them keep driving. One key is learning how to adapt how they drive to how their body is changing. Instructor Bert Gufstafson says that starts with recognizing you don't perceive the world the way you used to. “One of the subtle things is that you feel like it takes a long time to react and that cars seem to be be going faster than they really are. You say, 'Wow, those cars are going really fast and that your reaction time is a little slower and all of a sudden instead of taking a nice even brake you're coming to an intersection and you're braking hard." Modern cars can help. Blind spot monitors can help if something like an arthritic neck makes it tougher to look over your shoulder. The same goes for backup cameras and systems that warn if a driver's crossing behind you. Some cars will alert drivers drifting out of their lane. But modern systems are not good enough to bet your life on and eventually it may be time to hand over the keys. "And I think if you start the conversation slow,’ says Maria Ramirez-Trillo of AARP. “If you start with, you know, I noticed that you weren't feeling as comfortable driving at night anymore and their steps you maybe they don't drive at night anymore. And then another step, maybe let a family member or friend or neighbor take you to the groceries now." She says it's when someone stops driving to assure them relatives, or maybe driving services will make sure they are still able to move through the world. AARP offers a variety of courses and services to help older drivers keep driving, and to help them realize when they should stop. The U.S. National Highway Traffic Safety Administration has a page devoted to assessing the abilities of older drivers . It also offers advice for families and friends on how to have that difficult conversation on hanging up the car keys.